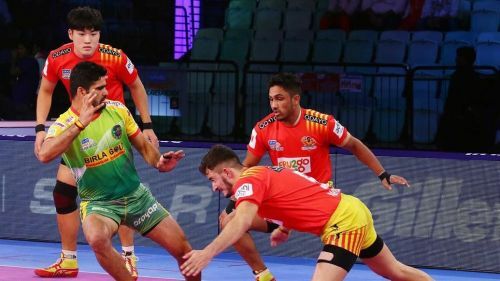 The Gujarat Fortunegiants exhibited a fine spell of play as an all-round performance from the Sunil Kumar-led side put a grinding halt to the Patna Pirates' unbeaten run In the Pro Kabaddi 2018 with a 45-27 win at the Thyagarajan Sports Complex in Delhi. 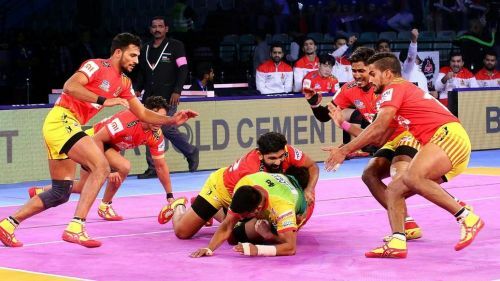 The game started on a positive note for the Fortunegiants as Sachin's running hand touch on Vikas Kale was met by a decisive chain tackle on Pardeep Narwal - which effectively opened the floodgates on the Pirates. Such was Pardeep's inefficiency on the day that he finished with just one point from the match, his worst performance in the league while his arch-nemesis was in the form of the unstoppable Parvesh Bhainswal, who picked up eight tackle points to his credit and continued his purple patch this season. With Parvesh wreaking havoc on one half, Sachin and Prapanjan added salt to the wound with a top show on the raiding front as they combined to pick 17 points and threw Jawahar Dagar's 'High-5' into the shadows. In the end, the Fortunegiants decimated the Pirates to be just behind U Mumba in the Pro Kabaddi Points Table. Here are the player ratings from the match. The Patna skipper was brought down on a vast majority of his raids and collected just a single point in the entire game as he was also subbed off after his poor run in this game, which had a direct impact on the outcome of the game. The right corner continued from where he left off as his ankle holds proved to be the antagonist to Sachin's plan of escaping with an easy point on a number of occasions. Dagar also picked up a 'High-5 from the game. Jaglan came into the team as a raider but made a bigger impact as a defender and picked up two tackle points apart from the two raid points from six raids. Deepak Narwal was in some good touch and pulled off a few clinical running hand touches that kept Patna in the hunt to reduce the lead. Yet, he was pinned down quite a few times and finished with just four raid points from 14 raids. Young Manjeet failed to find his feet all throughout the game as he managed to pick just one bonus point apart from two touch points in the second half and effected an ankle hold on Prapanjan. The cover defender was not in the best of form as he was often the target for Sachin's running hand touches while his dashes also lacked venom to bring down the raiders. The left corner defender was unlike his aggressive self as he looked unsettled in the defence unit and finished with just one tackle point from his five tackles in the game. The burly defender slotted into the cover position and proved to be a vital substitution as his holds fetched him four points but did not suffice to see his team ending on the positive side of the result. Vijay was subbed on as the lone man on the mat and picked up a bonus point to which he added another bonus and touch point from the game.